1. Following our membership check we have 175 members of the network well distributed across the regions. Now the Network Development team are compiling date from an audit they have done of the regions and the models they are using to run. 2. Our newsletter has been getting a fantastic open rate and there will be another making its way to your inbox soon, so keep your eyes peeled! 3. 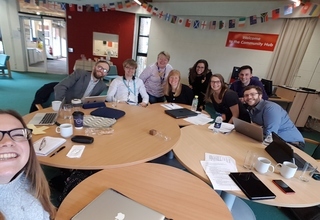 Our Policy and Best Practice team are looking at developing guidance around international volunteering and volunteer handbooks for our members (as voted in our latest survey!) There is also an international volunteering working group that has been set up within the network and will be meeting for the first time in May. 4. Our social media continues to grow and we have now reached 100 likes on Facebook! Do you follow us on Twitter or Facebook? 6. We now have 70 members registered on our website with access to our selection of resources! We are continuing to explore and develop the functionality. Don’t forget you can log on and create your membership here. 7. Around 200 events were registered for Student Volunteering Week and we had lots of engagement from charities this year! A survey will be circulated soon looking at your feedback with the dates for next year confirmed in July. 8. We have been looking at our GDPR compliance as a network and ensuring that we meet new guidelines. We will be making a few small changes as a committee but are already broadly compliant. To see the full minutes head to our resources page here.